Since 2016, I have been the artist-in-residence for an important prehistoric archaeological dig in SE Oregon that is changing the way that we look at Paleoindian emergence in North America. This project is in collaboration with Patrick O'Grady, of the UO Museum of Natural & Cultural history, who is the lead archaeologist on the Rimrock Draw Rockshelter on BLM land in SE Oregon. 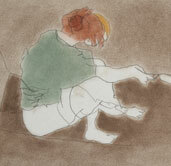 These recent drawings are a product of my participation at the dig. Camping with the crew for four-six weeks each summer, I spend the days observing the painstaking process of excavation and analysis while doing my own drawing, writing and photography. The 300+ raw earth pigments that I've collected in the region since 1997 have become a central focus, incorporating them into my drawings as well as introducing them to the crew, visiting scientists and other visitors. Previous to the archaeology project, my work had been about revealing/concealing, using direct journal writing within each piece to convey my thoughts. Many of my supplies come from raw materials in the local environment or ones gathered while traveling. This provides a direct connection to the source of my inspiration. From the high desert of Oregon to Oregon’s coast, I collect rock and raw earth to grind into pigments. 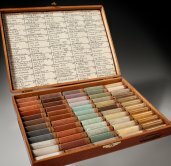 These pigments are then mixed with various binders to make different kinds of paint or used directly as loose pastels. In Oregon's Willamette Valley, I collect Black Walnuts to extract ink and Oregon White Oak galls to make another ink. 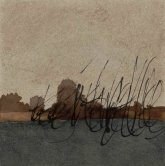 Thin, strong paper or stretched canvas is tinted with inks, written upon, and layered. The materials are used for their color, texture, blending characteristics - and earthiness; the underlying issue or topic of the piece guides all the material selection. After writing, concealing the words is intended to obscure and release the written thoughts and to allow the piece to take on a life of its own. I grew up in Ontario, Oregon on the edge of Oregon’s high desert. My mother took my siblings and me on many trips to explore, hike and observe the geology and wildlife. We also dug clay for her pottery. When I was a teenager, my father made a trip across the state and collected colorful rock and sediment from road-cuts. It was simply his way to mark the time while making the long drive alone in wide open spaces. What my parents did was lost in my memory until several years after I got the idea to collect color to make into pigment. After leaving the state for 26 years, I moved back to Oregon and decided to revisit the landscape of my childhood. Growing up, it hadn’t impressed me much as it was dry and gray/brown and I’d always longed to live where it was green and lush. But in 1996 I took a slow drive through the high desert to my hometown to take photographs and collect earth colors and plant materials that could be used in my artwork. My intention was to ultimately mix commercial paints to match those desert colors but when I returned to my studio, it dawned on me that I could reduce the rock to a powder and make my own paints. To begin with, I made acrylic paints then watercolors and finally loose pastels. In the 22 years since, I’ve worked with colors from more than 150 high desert sites and continue to find more as I explore additional corners of that vast region.